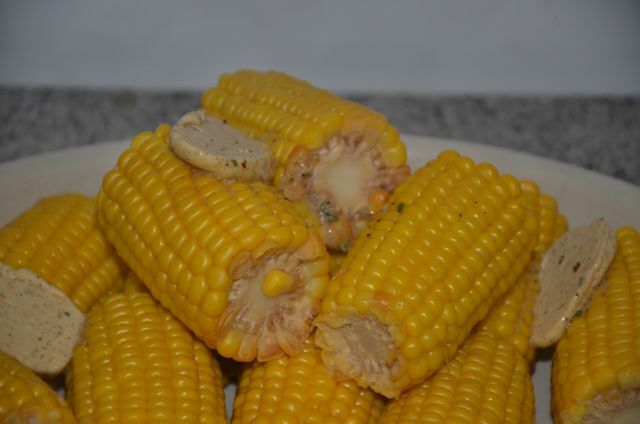 Really amazing, fresh corn doesn't need anything other than a bit of butter and maybe a little salt. That said, I love to eat corn as much as possible when it's in season, which can get a little mundane if you do it the same way every time. Switching up the flavors in the butter is one way of getting a variation of flavors. Making a homemade flavored butter is simple, can be done in advance and can also be done in bulk for yummy flavored butters that you have on hand all the time. I love keeping these in the fridge for steaks, corn cobs, potatoes and more, but they're also not too difficult to whip up for a dinner party either. This recipe provides enough to feed a whole BBQ, but don't feel like you can't just make two ears of corn and pop the rest of the butter in the fridge to use later. I'm sure you could even freeze the butter if you wanted, though I can't say I've tried that before. 1. At least an hour 1/2 before you want to serve (more if possible), start making the butter. Add all of the ingredients to a medium-sized mixing bowl and mix together with an electric hand mixer (or other mixing method of your choice). When the butter is well-mixed with all of the ingredients, it's ready to shape. 2. To shape the butter, scoop it out onto a large sheet of cling film, trying to keep it in a contained short cylinder shape (about 3 or 4 inches). Using the slack of the cling film on either side roll the butter back and forth in the cling film to get as much of a cylindrical shape as possible. I'm not particularly fussy about perfection here, but if you are, you may want to look into using some kind of mold. When the desired shape is reached, seal up the ends of the cling film and pop the butter into the fridge for at least an hour but preferably more to chill. 3. Put a large pot of water on to boil and cook the corn cobs in the boiling water for 5 to 7 minutes or until the desired tenderness is reached. 4. To serve, slice the chilled butter and serve on the corn or on the side with a bit of salt available as well. Click here for more flavored butter recipes.